- No more iTunes, transfer/back up/manage iPhone files as simple as 1-2-3. - 1 Year free upgrade. Discount is only for 50 customers. - Lifetime free upgrade. Discount is only for 50 customers. ● Transfer 4k video/photo, music, ebook between PC and iDevice. ● Remove DRM, export & convert iTunes music/video/audio book. ● Manage music/Voice, create ringtone; use iDevice as USB. ● Auto detect & convert iOS-unsupported videos & music. Giveaway - This offer is expired! "When it comes to managing images and videos, WinX MediaTrans makes it easy to edit and transfer media files between devices, without losing time or space." "Winx mediatrans does surprise me with its transfer speed. I can transfer 100 pics (each above 2.5M) from my iPhone6 (iOS 9.3.1) to PC in only 10 seconds." "I loved the interface so much, I went ahead and bought it without much thought. This was as much to do with the very solid other products I have bought from Digiarty in the past as for the very nice inteface." selection; 8 seconds to transfer 100 4K photos. Create/edit/delete and rebuild playlists; add/manage song, etc. ; auto convert most music to AAC or MP3. convert any video to fit iDevice; auto rotate video. Decode iTunes music, movie, audio book; Convert iTunes M4V to DRM-free MP4 video. Manage ibook. YOUR ULTIMATE MEDIA BUNDLE, SAVE MORE. 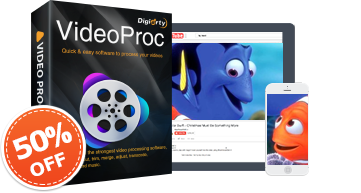 Strongest video processing tool to edit, cut, crop, merge, convert & download video. All-in-one free HD video/music player, DVD player and AirPlay media streamer. - your comprehensive media solution. ● Cut, resize, split, denoise, stabilize, etc. ● Download video/audio, playlist, channel. 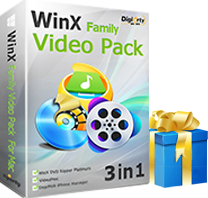 ● Convert videos, audios. Tons of profiles. ● Record PC screen or video for uploading. ● Strongest for 99-title, new, old disc. ● DVD to MP4, AVI, MOV; to NAS, mobile ,etc. ● Keep intact quality. Customize & edit. ● Rip to DVD in 5 min with hardware acceleration. 2. Please note that the products being sold in this page are only for 1 PC if we do not mark with 2 PCs or 6 PCs. 1. Completely free update to enjoy any major or minor improvement. 2. HTTPS & SSL secured purchase. Your financial info is safeguarded. 3. Worry-free money back guarantee in 30 days.